Discover the hundreds shops at Galeries Lafayette shopping plaza, which has the biggest choice of clothes brands in Paris. The Galeries Lafayette is a French store chain with its flagship store based in Paris on Boulevard Haussmann in the 9th district. The chain was born in 1895 thanks Theophile Bader who opened a fashion shop. Only 10 years after, the company had in its property 3 entire buildings, included the current of Boulevard Haussmann. The group is involved to promote the French “Art of Living” creating a special atmosphere inside their store. The Galeries Lafayette earnings are over the 1 billion per years. The store is run by a family and as the years passing by, they continue to improve invest and anticipate the future in order to give an always better option to their customers. 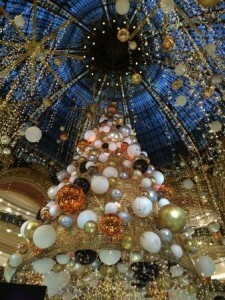 Why should you go to Galeries Lafayette? 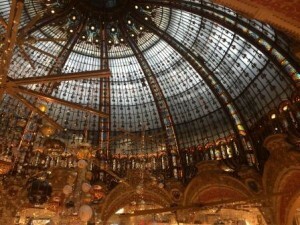 First of all, go at Galeries Lafayette means falling in love for shopping. If you are a shopping lover you cannot miss this huge store in Paris. 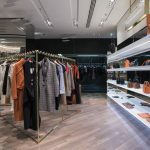 It gives the biggest brand options in all of Paris, there you will find brands as Burberry, Louis Vuitton, Dior, Dolce&Gabbana, Armani, Marc Jacobs and hundreds of others among the most and the least luxury. You will discover all the best brands in the world in a cosy and family environment where the hospitality, the good service and the variety of choice is guaranteed. 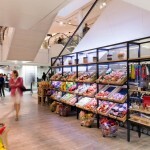 Two floors are dedicated for the Lafayette Gourmet providing the best food and daily fresh grocery among regional and international specialities. Furthermore a tea room, reading room and a smoking room complement the interior area in order to give customers a relaxing moment after shopping. At the top, the roof offers a delightful view of Paris. Galeries Lafayette hosts many people which are just interesting in the building architecture. The dome which rises a height of 43 metres, and the Neo-byzantine style glass windows, soon became the symbol of Galeries Lafayette. Go at Galeries Lafayette is a really Parisian experience unmissable for everyone. For senior citizens the visit is suggested outside the weekend time for crowding reasons. 3 more articles you can be interesting in.